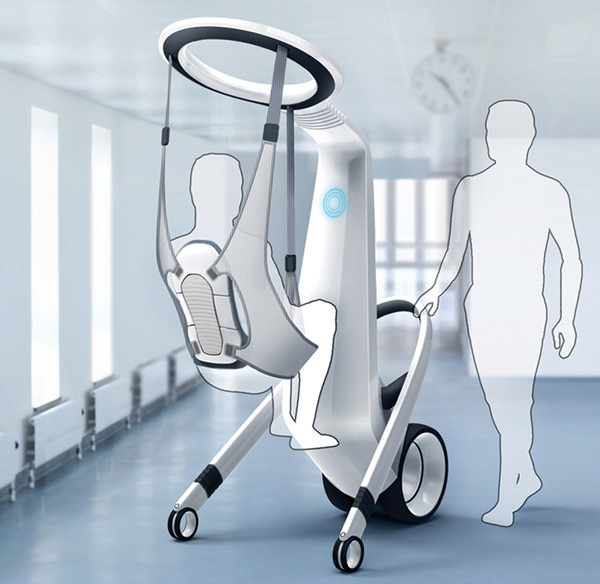 This strange looking contraption is the ITRI MediRobot, a concept design from Pilotfish, which aims to help medical professionals and care givers transport patients with limited mobility with quickly and efficiently. There are many ways patients can be transported just a few steps or even longer distances, but the ITRI MediRobot doesn’t require that you have more than one piece of equipment and displays all kind of information about weight and blood pressure through a series of sensors too. The robotic device can lift a patient from a bed, a wheelchair, the floor, or just help with general walking assistance and means all of the focus is on the patient, so caregivers aren’t worried about straining themselves in the process. However, Pilotfish are keen for the MediRobot to not just be seen as a transportation device, but as an important part of patients’ lives, as there’s an intuitive dashboard and a number of animations and interactive patterns to keep them engaged. Although the ITRI MediRobot is only a concept right now (and probably a pretty pricey piece of equipment), it’s interesting to see how robotic advances are being used to help those with disabilities.